He was born in Grodno. Orphaned at age thirteen, he was apprenticed to a watchmaker. At night he studied in the synagogue study hall. He later wandered through the cities of southern Russia. 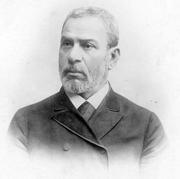 He returned to Grodno in 1858, took up self-study, and became a teacher of Hebrew. In 1876 he debuted in print in Hebrew with an adaptation of Grace Aguilar’s Emek haarazim (The vale of cedars) which had great success and gave him the reputation as one of the finest of Hebrew stylists. He became a “lover of Zion” and began to campaign for the Jewish settlement in the land of Israel in Hamelits (The advocate). Over the years 1883-1886, he was the actual editor of the newspaper and published there a series of articles and feature pieces under the pen name H”Sh (Har-Shalom [Mt. Peace]). In 1886 he settled in Warsaw. He contributed to Sokolov’s Hatsfira (The siren) and Haasif (The harvest), edited the general encyclopedia Haeshkol (The cluster), and was until 1891 the censor for Hebrew and Yiddish books. Through Aḥiasef, he published his Korot hayehudim besefarad (History of the Jews of Sefarad) (Warsaw, 1899/1900), 316 pp. ; and a fine translation of Moritz Güdemann’s Hatora vehaḥayim beartsot hamaarav biyeme habenayim (Torah and life in the West in the Middle Ages [original: Geschichte des Erziehungswesens und der Cultur der abendländischen Juden während des Mittelalters (History of the education and culture of occidental Jews during the Middle Ages)]) (Warsaw, 1896-1899). He especially made a name for himself for his Hebrew adaptation of Hermann Reckendorf’s Jewish historical novels and stories published under the title, Zikhronot levet david (Memoirs of the House of David) (Warsaw: Aḥiasef, 1893-1900), which went through numerous editions. Fridberg reworked all of the stories, added new material, enlarged, and expanded them. In 1902 he also published a Hebrew textbook entitled Safa leneemanim (Language for the faithful); the second part remained in manuscript. He was a friend of the Yiddish language and literature. In M. Spektor’s Hoyz-fraynd (House friend) 1, he published one of his best works, memoirs concerning Avraham Mapu; and in Spektor’s Familyen fraynd (Family friend) 1, he published a translation of Constantine Shapiro’s poem, “Meḥezyonot bat ami (Visions of my people), under the title “Dovid hameylekhs keyver” (King David’s grave). He also contributed to Yudishes folks-blat (Jewish people’s newspaper). He began later to rework his major work Zikhronot levet david into Yiddish and published it in Yud (Jew) in 1899-1900, under the title “Di familyen-papirn, oder zikhroynes fun dovid hameylekhs familye” (The family papers, or memoirs of the family of King David). The same periodical published, among other items, his “Zikhroynes fun der rusish-terkishe milkhome” (Memoirs of the Russo-Turkish war) in 1900. He died in Warsaw. Sources: Zalmen Reyzen, Leksikon, vol. 3; M. Y. Freyd, in Literarishe bleter (Warsaw) (May 6, 1927), pp. 340-42; Shimen Dubnov, in Tog (New York) (January 21, 1933); M. ben Hillel Hakohen, in Sefer hayovel shel hadoar (Jubilee volume for Hadoar) (New York, 1926/1927); A. R. Malachi, Igrot david frishman (The letter of David Frishman) (New York, 1927); Dr. Yisrael Klausner, Behitorer am (Amid the awakening of the people) (Jerusalem, 1962); Mikhl Hakohen Sinai, Grodner opklangen (Grodno echoes) (Buenos Aires, 1951), pp. 5-6; Yosef Likhtenboym, Hasipur haivri (The Hebrew story) (Tel Aviv, 1955).